“Businesses have gone data crazy,” declared Forbes.com recently, listing big data expertise as number one on its list of technical skills with exploding job demand, with an astonishing 3,977% increase from 2011 to 2015. And according to CIO.com, the continued shortage of data experts encompasses more than data scientists, data engineers and data analysts, but also the organizational leaders who must interpret and use the resulting data for business decision-making. In reality, the demand for data analysis expertise reaches far beyond stereotypically “tech” jobs, and extends into all fields and industries where there’s a need to analyze large datasets. Examples are healthcare, finance and insurance, sales and marketing, research and more. The University of Delaware’s popular Certificate in Analytics: Optimizing Big Data program, now in its fifth year, has attracted a broad range of professionals seeking to gain data analytics expertise. Whether to meet data analysis challenges in their current roles, prepare for career change, or add a new and relevant job credential to their resumes, they’ve cited the program as instrumental in their career growth. “The certificate program without a doubt changed my life and led me to a great career path with a great company,” commented program graduate Tracy Ganjoin, a business analyst at W.L. Gore. “My recent job interviews had one thing in common: the companies did not yet have a full analytics department but were preparing to invest in the subject, which provides great opportunity for a unique skill set that organizations are seeking,” she said. The Certificate in Analytics: Optimizing Big Data program is offered in fall and spring semesters by the University of Delaware’s Division of Professional and Continuing Studies, meeting one evening per week for approximately three months. 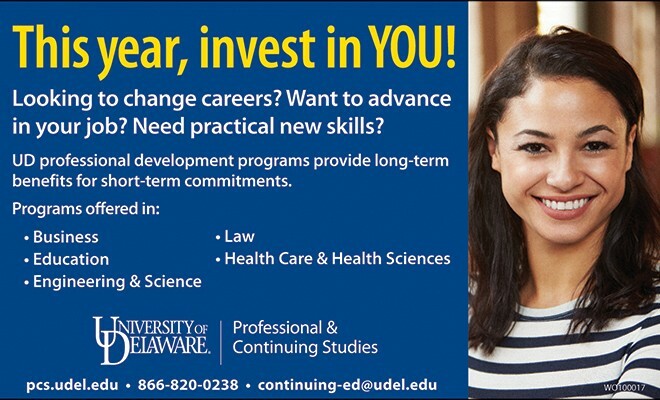 For more information, including a detailed curriculum description, visitvwww.pcs.udel.edu/data, write to continuing-ed@udel.edu or call 302-831-7600.